Building our Off Grid Outdoor Kitchen. We have high expectations for the Off Grid Outdoor Kitchen and hope it brings us closer to sustainability. Let me expand on that a bit. First, if you haven’t seen any of the videos on our Off Grid Outdoor Kitchen here is one video. After seeing the building my explanation will make more sense. The building is south facing with a lot of glass on the south side. This will help warm the Off Grid Outdoor Kitchen in the winter and keep it cool in the summer. It is also a convertible building. The two front doors open giving us an 8-foot wide opening and one of the side windows slides open giving us 8-feet by 4-feet of air flow. We are going to have a wood cook stove in the kitchen also. The wood cook stove will be used to heat and cook with. With the southern exposure and the glass, we will be able to use it as a green house to start all of our plants in it during the late winter. 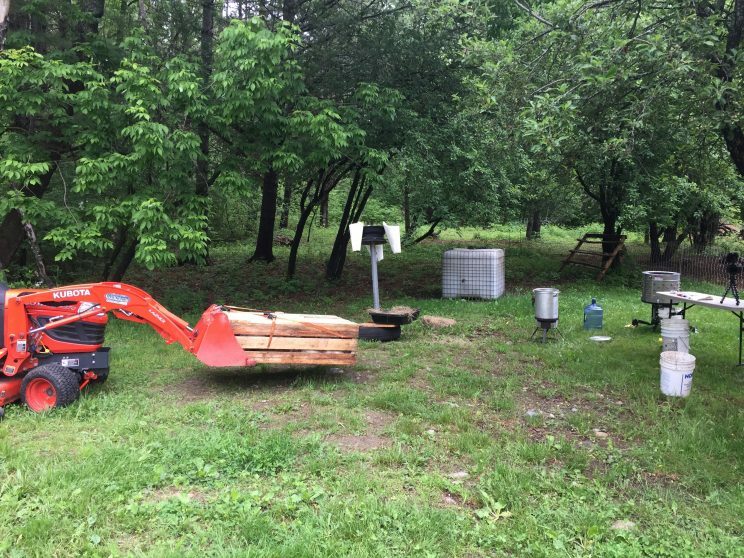 Having the wood cook stove will give us the ability to keep it heated at night for the plants. We installed a metal roof on the Off Grid Outdoor Kitchen to make it easier and cleaner to collect the rain water off the roof. We have plans to add a gutter system that will drain to the back of the building. On the back side of the Kitchen, we are going to install pallet shelving and set two IBC totes on the shelving about 6 feet off the ground. Each IBC tote holds 250 gallons, we will be able to store 500 gallons. Having the totes elevated off the ground will make it so we can have gravity fed water to the Off Grid Outdoor Kitchen! This means water pressure with out using any electricity! Awesome right? We are planning on adding solar to the Off Grid Outdoor Kitchen when our budget allows it. We can’t wait until the Off Grid Outdoor Kitchen is all set up and we are using to for all of our canning needs. From cleaning the abundance of vegetables, cutting them up and getting them ready and using the pressure canner. The really nice part about canning in the outdoor kitchen is that we don’t have to heat up the house in the warm summer days. We can open up all the doors and windows and get a great cross breeze. We are going to have a nice place out from the weather and the sun for harvesting our pasture-raised meat birds. It won’t matter if it’s raining out or if the sun is beating down on us. We will have a great place to set up in. That means no more standing in the wet grass or having to bring the raw chickens in the house and making a mess inside our kitchen. 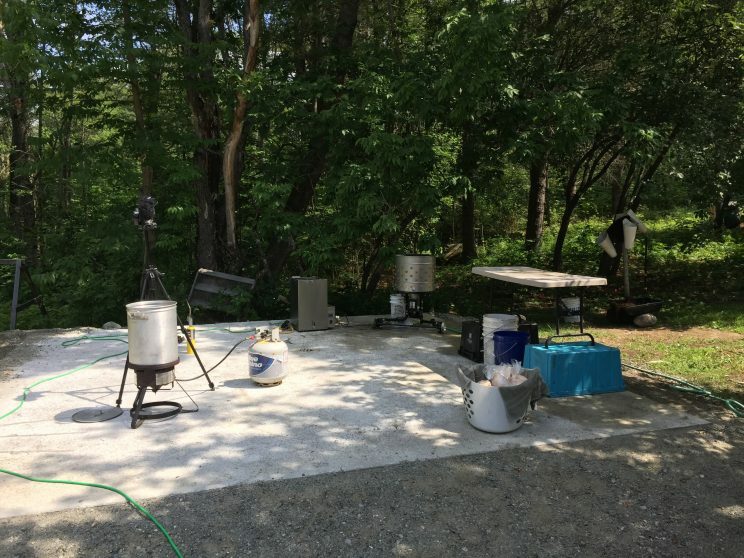 We are going to be able to do the whole process in the Off Grid Outdoor Kitchen. If we make a mess we can get out the hose and hose everything down and off the concrete floors right outside! Just having a concrete slab to for our processing set up made a huge difference! 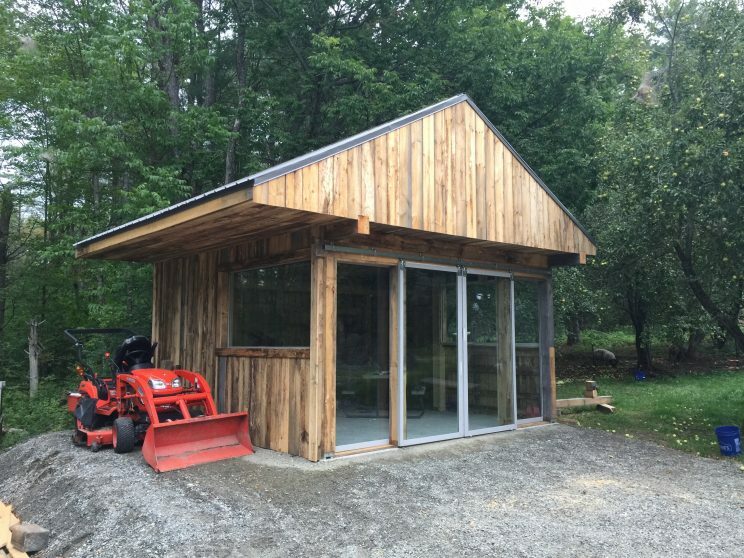 I can just imagine how nice it will be once the Off Grid Outdoor Kitchen is all setup! We are also going to have a nice warm place to host the Hand Hewn Farm three-day hog harvesting class this October. Once we learn the new skills that Andy and Doug are going to teach us. We will have a great place to harvest our own pigs from now on and preserve the meats. I could go on and on about what we are going to be using the outdoor kitchen for. Soon we will be cranking on our borrowed apple cider press and grinding up some many apples and squeezing them into apple cider. But I will stop here and save some for another Youtube video and future blog post. 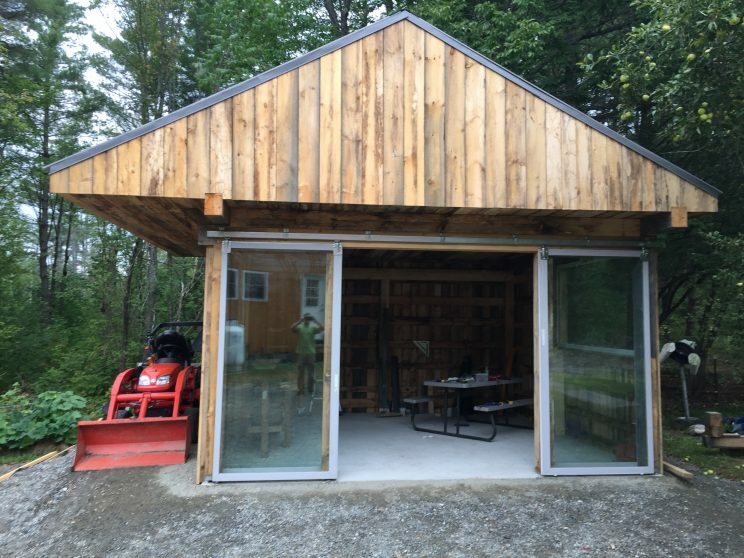 When we build projects here that is one of our guidelines is that we need to do them when we can afford them and not go into debt just because we want something! That is the reason why our house is hooked to the power grid. It is more feasible for us to stay connected until we can afford a solar system. The Off Grid Outdoor Kitchen will get us one step closer too not depending on fossil fuels and making Lumnah Acres more Sustainable! 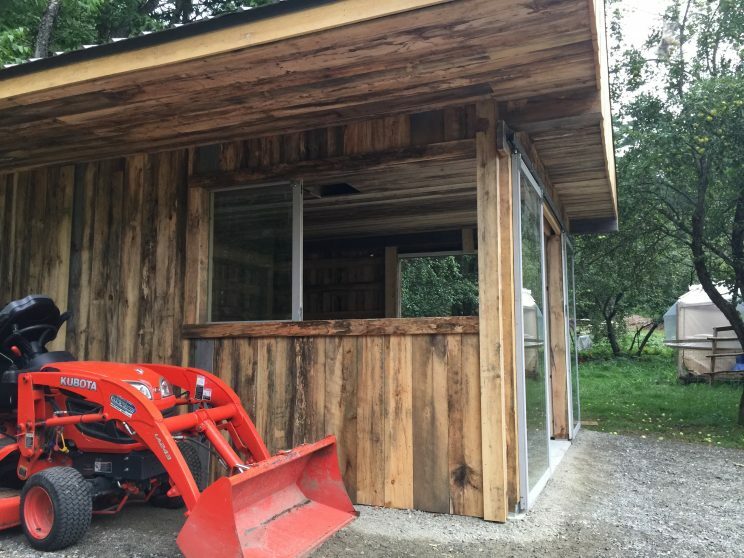 You’ve done a wonderful job with the Offgrid Outdoor Kitchen so far and your plans for the inside fit out will surely only improve that even more. With it’s rough timber finish, it’s a thing of beauty and your design has made it wonderfully versatile, which I’m sure will become a focal point of endless functionality. That you’ve achieved all of this without incurring any debt and much of it through the use of re-purposed materials is a tribute to your resourcefulness and clever approach to sustainability. I hope it brings you as much joy in the using of it, as I’ve had in watching you construct it. Thank you for sharing that journey! Thanks! We hope that we will get many uses out of the Off Grid Outdoor Kitchen. We love using repurposed items, saves them from the land fills and saves us a bunch of cash! Congratulations on your 10k Subbies and your new webpage! I’d love to be entered into the drawing for the incubator! Thanks. If you sign up for the newsletter you are entered to win! Love your Channel. I miss MRS PIGS. also love your outdoor kitchen. Looking forward to more viewing. Love the outdoor kitchen. I am watching the replay and there is no problem getting to the website. I’ve signed up for the newsletter and it looks great. Loving your channel as one of my top several channels. Sometimes I feel like a stalker LOL. Looking forward to continuing to follow you from our urban limited Homestead, at our age, we can’t do much more. Living vicariously here. Thanks! 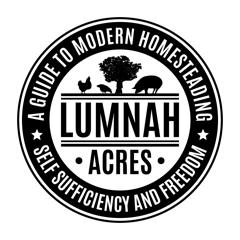 Where is your urban Homestead? I bet you can still do plenty! Great live sharing, thanks! I am signed up for the newsletter, but I already have my incubator and since moving to township, can’t talk landowner into chickens, YET!!!! Are you going to record the class for pig processing? we will be recording it. We will do our daily vlog video on them. Not sure how much detailed video we will get or how we will use the extra footage. I have watched all the videos on the building of the outdoor kitchen. Loved the build and the wood. I am looking forward to seeing many of your happy memories. Very well written post. It will be useful to everyone who utilizes it, including myself. Keep doing what you are doing – looking forward to more posts.